Some people take the best boat cover as an accessory. Some take it as a weapon. Wondering what the second statement means? How much did you pay for your boat? Two grand? Ten grand? Whatever the figure, there’s one thing we can agree on – boats aren’t a cheap investment. You want to protect it, right? Well, elements as small as dust, moisture, and snow can ruin your boat. If you’ve ever left your ride unprotected during winter or in a rainy season, you know what we’re talking about. The moisture slowly seeps into the seats, encouraging the growth of mold and mildew. As a result, a bad smell develops and the interiors become a nursery for bacteria. Bird drop their excrement in there and little insects make your boat their house and playground. Dust accumulates. These elements slowly take away the beauty of your ride and reduce its life. A good boat cover comes into play as a defense weapon again the elements. If you want to give your boat good protection during storage or transportation, then this article is for you. We’re going to help you find a nice, fitting top for your vessel. What Are the Benefits of Using A Cover for Boat & Kayak? It makes your boat last longer – unprotected, your boat is vulnerable to environmental factors like rain, direct sunlight, dust, and snow. Over time, they tarnish the color and cause the metal to rust. A boat top protects your vessel from these elements, thus helping it stay in good condition longer. Reduces maintenance costs – by protecting your boat from damage, a good cover helps reduce the maintenance costs. For instance, you don’t have to repaint the vessel as frequently as you’d need to if you weren’t using a cover. Boosts security – A cover makes it harder for burglars to get inside the boat and take off with your valuables or accessories like marine radio or the seats. Keeps your ride cleaner – With the cover on, the dust, grime, and insects won’t accumulate on the inside. That means less frequency and effort of cleaning. Makes it easier to find the boat – in the docks, you might be parking your boat alongside many others that may be similar. 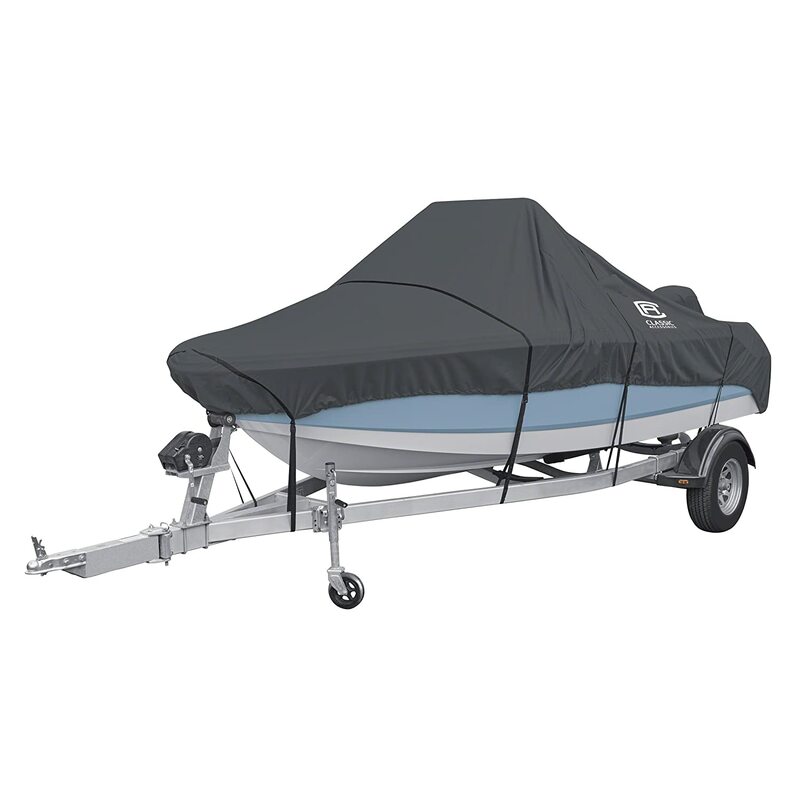 This can make finding your boat a hassle, but a unique boat cover makes your boat very easy to spot. If you’re looking for a boat top of great quality and superb fit, then you sure want to try the MSC Heavy Duty 600D. This canvas cover is made of marine-grade polyester, a material that holds up very well. The material is further enhanced with a double PU coating, whose smooth, long-lasting finish resists UV rays, moisture, chemical exposure, and corrosion. In short, it will serve you well for a few years. On Amazon, you can select between six color options for this – black, beige, forest green, gray, pacific blue, and navy. From this wide color range, you sure can get something that suits your boat/taste. There are six models of this cover. The models are classified according to size, and all you have to do is click the model that suits your boat. What makes it even more versatile is that the top is made for different types of boats. If you own a V-hull, tri-hull or runabout boat, then the product is for you. Do you want a cover for long-term storage? Or do you need it for mooring? The top is built for both purposes. The only problem is that it doesn’t seem to be suited for highway travel at high speeds. You got to move slowly; otherwise, the material will fray. But again, you get what you pay for. For a price as low as 64 to 199 bucks (current range), that’s a fair deal. Better than what most brands offer. If you want your boat to last a long time, then the MSC Heavy Duty 600D is perfect for you. Its material is pretty sturdy and waterproof. It will protect your vessel efficiently from harmful factors. Do you need a boat cover that is super easy to put on your boat? A model that’s going to be a perfect fit and look so good on your boat? That would be the Classic Accessories StormPro. This model comes with 7 size options. That way, you can get the cover that will fit your boat well. The cover’s design is meant to optimize the ease of use. For instance, the elastic hem enables you to fit it on your boat with minimal effort without having to adjust the straps too much. The strap and buckle system makes things even better. Its quick-release nature makes fitting and removal a fast and effortless process. How does it hold up? You ask. Well, first, the material is 100% polyester. That gives it lots of resilience, making it withstand the pressures of rain, dust, stretch, and UV rays for a long time. The cover doesn’t stretch or shrink for years, and it protects your boat efficiently from water, direct sunlight, and other elements. It’s definitely a model you can rely on for all-weather protection. There’s a unique feature that doesn’t come with many covers – the support pole. This keeps water from pooling and with its stiffening power, it reduces wind pressure and helps water escape. Our only problem with the Classic Accessories StormPro is that sometimes, the fasteners are substandard. On the brighter side, the manufacturer is highly responsive and caring, and there’s a strong likelihood you’ll get a good replacement quickly. If you want to get a nice custom fit, you stand to benefit from this cover’s elastic hem. The integrated adjustable strap and buckle system with a quick-release feature will ease the fitting and removal tasks. It’ll also make transportation with a trailer a piece of cake. Looking for a great cover that is fairly priced? Check out the Leader Accessories 600D. 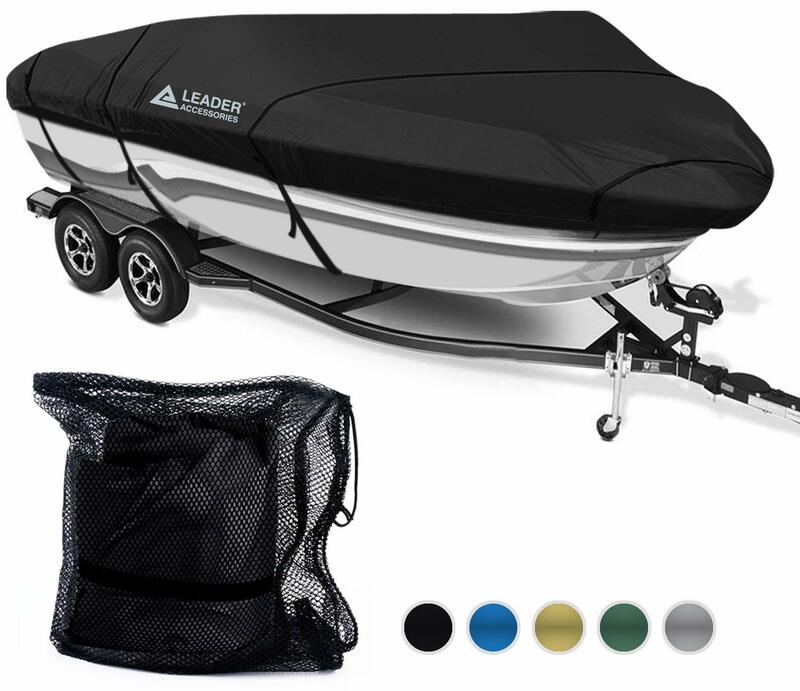 This trailerable boat cover is made of polyester fabric. It is marine grade and superbly strong against fading, tearing, and deterioration in general. As it is coated with urethane, the cover repels water and mildew pretty good, hence protecting the body of your boat effectively. The seams are double stitched, and the straps are reinforced. This awesome design helps in keeping water at bay. If there’s heavy rain and your boat is outdoors, you have peace of mind in knowing that the water has no way of getting inside the vessel. Want to know why this model is so popular? Simple! It fits most of the common hull styles. If you have a V or tri hull or a runabout, chances are that the cover will fit your boat. Furthermore, you have six size options to choose from. Picking the correct fit for one’s boat is a task we’ve seen many boaters struggle with. Unfortunately, many of them end up picking the wrong size and get frustrated, thinking there’s something wrong with the cover. But the manufacturer of things makes size selection incredibly easy for you. On Amazon, they’ve placed a chart displaying the seven different models they offer. Here, you get a table of the various size ranges in length and beam width. They’ve even included a short guide on how to measure your boat! So far, we don’t have any complaint on this model. Unlike most budget covers, this one doesn’t fray when you transport it with a trailer. You can move at speeds of up to 70mph without any fraying issues. Want to be able to drive at 75 mph without the risk of your cover ripping or going loose? You just found the right cover – the iCOVER Trailerable Boat Cover. This cover is built with strong materials, and good stitching gives it the resilience to withstand pressure when the trailer is moving at high speed. What material is it made of? You ask. It is crafted from high-quality marine-grade polyester fabric, which many be 300 or 600 denier depending on your selection. The material is resistant to UV, mildew, and tear. That means it will keep your boat protected from these elements of deterioration. It also means the cover will hold up well. When it comes to the fit, the cover is a top performer. It has an elastic cord sewn into hem. This ensures the fit is secure and snug. The installation is easy and fast, thanks to the integrated strap and buckle system. Adjustment and removal are a breeze with the quick release buckle. If you’re transporting your boat in windy conditions or a storm, wind pressure might be a problem. To deal with it, the cover has air vents at the rear at both sides. The only problem with this model is that it doesn’t come with instructions for using the straps. Tying them might be a bit of a hassle for the first time, but remember, there are tons of helpful videos on YouTube. Aside from that small issue, the cover is great – it fits really well and lasts years. And again, it’s available in different sizes and colors to suit your needs. If you want a sturdy boat cover that will keep your boat protected for over 7 years, then you got to try the Classic Accessories Stellex. This cover is manufactured using tough polyester fabric. It is, therefore, resistant to the harshest weather conditions including ice, snow, and heavy showers. As it features a perfect stitching, the cover remains safe from fraying or tearing for years. The cool thing about this product is that it is made for everyone. Whether you own a v-hull, bass or utility boat, there’s just the perfect size for you. On the product’s amazon page, you’ll be able to select the exact fit for you. There are sizes ranging from 12 feet to 22 feet for the length and 68 to 106 inches for the width. Selecting the right model is as easy as hitting the drop-down menu and choosing the right fit for your boat. You want a secure fit that is neatly customized, right? You’ll be glad to know that the hem has a strong elastic cord that helps you achieve that nice fit without much effort. The trailering straps make things even better by holding the cover securely onto your boat. These help keep the cover in good shape when you tow the boat. Together with the cover’s sturdy construction, the straps help ensure there’s no fraying or tearing during transportation. For the ease of installation, the manufacturer integrates quick-release buckles into the strap system. Some of the sizes (especially the larger ones) have an issue with water pooling at the top. You might have to use more than one support pole. But overall, you’ll be happy with this cover. Don’t hesitate to check it out. If your boat is in the 16 to 22 feet length range, then you need to hear what AmazonBasics has to offer. The AmazonBasics Boat Cover is made for v-hull, bass boats and runabouts with sizes ranging between 16 to 22 feet for the length and 98 to 106 inches for the width. You’ll be surprised at how well the cover holds up. It’s made of 100% polyester, which keeps it from shrinking, stretching, tearing, and fraying for a long time. This high-grade material ensures your boat is safe from outdoor elements like snow, windy, moisture, dust, and mildew. Whether you’re transporting your boat or storing it outdoors, this is a cover you can rely on to offer that much needed protection. One of the concerns that people have when using boat covers is the growth of mold. AmazonBasics has you covered here. They’ve left little air pores on the cover to allow air in and stop the growth of mold. When you purchase this product, you don’t just get the cover. You get quality straps as well. These are well designed and meant to secure the cover to the sides of the trailer rather than under the boat. The straps are totally detachable so you can tie them where it fits you. To increase the ease of use, the straps come with buckles. It’s not a good sight to see wrinkles all over your boat cover. Fortunately, this cover is thick, and its design is meant to prevent wrinkling. Other than that, the cover is superb. It performs well and lasts a long time. Looking for a cover that can survive a hurricane? This is it. Why? Other brands normally use 300 or 600 denier fabric to make their boat covers. Budge uses 600 and 1200 denier fabric to make the Budge B-621-X7. Denier is the unit used to measure the thickness of fabric; the higher the figure, the bigger the thickness. The 1200 denier model is really thick and outstandingly capable of withstanding heavy rain, snow, wind, and other damaging weather elements. It’s the perfect material for towing through bad weather. In case your boat is caught in a hurricane, there’s a chance it will survive, as the coat offers super resilient protection. Some covers come with fully detachable straps. While these can be removed and applied wherever the user wants, they’re not very effective. The Budge cover’s straps are sewn-in. This puts them in a position where they’re able to hold the cover securely. This is very helpful during transportation, as it ensures the cover is properly held even when you’re moving at high speeds or when the conditions are windy. The integrated fast-release buckles make both the installation and the removal very easy. Worried about mold and mildew destroying your boat’s interiors? Don’t be. The air vents on this cover allow the air in and the moisture to escape, hence discouraging the growth of mold and mildew. The only drawback with this cover is that you might have problems with water pooling at the top. But remember, a few support poles can fix the issue. You can get them on amazon for less than 20 bucks each. Overall, this is the best boat cover for the money. It offers you lasting protection from rain, mold, mildew, dust, and many other damaging elements. We’re quite certain that you will LOVE it. Select your ideal boat cover from Classic Accessories StormPro’s 5 size options. As its name signifies, the Classic Accessories StormPro is built to help your boat survive the stormy days. Its 600 denier material is a powerful, heavy duty guard that actively defends your boat from the heavy raindrops, snow, or destructive winds. The high-strength polyester fabric is sewn in such a way that water has no way of getting in. This material also helps the cover stay strong, so it can provide you with lasting protection. You won’t have to buy a replacement cover in years to come. The heavy-duty construction is good news for you if you need to tow the boat from time to time. This is not one of those flimsy covers that tear or fray when the trailer moves at speeds above 50 mph. It remains strong and intact even when you move at 70 mph. What about the installation? It is a piece of cake, thanks to the integrated strap and buckle system. The straps are designed to be tied around sides of the trailer, and not the bottom – this makes the work easier for you. At the lower sides of the cover is an elastic band sewn into the hem. This helps give the cover a nice fit without having to use much effort. And subsequently, it makes setting and adjusting the straps a no-hassle task. Now, when you purchase the Classic Accessories StormPro, you’re given a support pole for free. This is meant to help you keep water from pooling at the top. Unfortunately, many users say that the pole is poorly designed and doesn’t work properly. This is the only issue affecting this deal, and we’re hoping that the manufacturer is working on resolving it. Other than that, the cover is a great buy; you’ll wish you got it sooner. Offers great protection against water, mold, mildew, dust, bird droppings, etc. If you have a tri hull or v-hull bass or runabout boat with a length of 17 to 19 feet, you might want to check out the Anglink Waterproof Boat Cover. One of the coolest facts about this coat is that it’s able to withstand water pressure of up to 2000 pa. And tell you what? Most other covers can hardly hold off 1500 pa. The superior risistance to water pressure is made possible by the material that the cover is made of. It is 600 denier marine-grade polyester and not just that; the manufacturer uses an innovative textile process that involves a 2-thread stitching to make sure the water stays out. The seams are sealed with waterproof strips to further reduce the chances of the water seeping into your ride. Hence, this is the perfect cover if you live in an area that normally receives heavy downpours. The cover’s black color looks absolutely gorgeous on most boats. Here’s the cool part – it doesn’t fade in years. One of the main reasons why fabrics fade is exposure to direct sunlight. To protect it from that, the cover is enhanced with anti-UV properties. In addition to that, a special dyeing process, using high-grade dyes is used to ensure there’s high colorfastness. Hence, the cover will not release dye and stain your boat, and secondly, the fading will take place very slowly and minimally; you won’t notice any color difference. There’s some room for improvement though. The 2 straps at the rear are different from the rest of the straps, and they’re a bit of a hassle to tie. Other than that, the cover is really nice. It comes with 11 straps, an elastic hem, and a 3 year warranty. It’s definitely good for the price. If you’re based in a challenging marine environment and you need a boat cover to keep your boat safe, you stand to benefit from the Seamander Runabout Boat Cover. It is a 600 denier polycanvas material with the strength and sturdiness you need to protect your boat from rain, snow, and strong winds. Are you worried about abrasion and corrosion coming from salt water or chemical exposure? With its double PU coating, the cover is able to keep all these threats at bay. The coatings also provide a smooth, durable finish that enhances both the looks and the longevity. Water resistance is great with this cover. The marine-grade thread and the interlocking double-stitched seams are there to ensure no water seeps in. When transporting the boat, you want to ensure the cover is tightly held. The 12 adjustable straps are there to make that happen. One of the most amazing facts about this cover is that it is made for almost everyone. It is made for a v-hull, tri-hull, bass boat, fishing kayak, and more boat styles. The versatility further extends to the sizes. If your boat’s length is between 14 and 24 feet, and the beam width is between 68 and 102 inches, then don’t get left out. Go to the products amazon page and select your ideal size. Be sure to select your preferred color from the 7 color options. Some users told us the cover left a mark on their interiors when they first installed it. But, they informed us that they were able to remove the marks effortlessly. They also said the cover faded a bit in the first year of use, after which it ceased to fade. Other than that issue, most of the users confirmed that the cover is superb. It offers good protection and lasts more than 5 years in a harsh climate. If you’re looking for the cheapest boat cover for your v-hull runabout, then you might want to hear about the PrimeShield Heavy Duty Boat Cover. This cover comes in 5 different size options ranging from 14 to 22 feet for the length and 68 to 106 inches for the width. All the sizes are currently priced below 100 bucks. While it’s true to say that low price signifies cheap features, these covers are different; they’re pretty high-quality. How? Let’s see. When seeking to find out whether the cover is worth it, we should first consider the construction. The cover is made of a 300/600 polyester fabric that is enhanced with a PU coating for all-weather protection. Let’s break that down a bit. The polyester material is stitched finely to keep the elements out, particularly water. With double stitched interlocking seams, the material is able to remain intact despite the forces of stretch. This double stitching and the interlocking threads make certain there’s no space for water to seep in through the seams. Because of the innovative construction, the cover is able to last 5 years without tearing or getting damaged to the degree of being unusable. The design helps to protect your ride efficiently from rain, UV rays, dust, snow, and more. You want to know about the fit, don’t you? Well, in the hem, an elastic cord is tied along to give your boat a snug fit all around. The strap and buckle system makes sure that the fit is secure. It prevents the cover from being blown away when you’re towing the boat or when there are strong winds. The only disadvantage is that this model doesn’t seem to hold up past 5 years. Hopefully, they’ll improve the future models. But for the price, 5 years of flawless service are excellent. 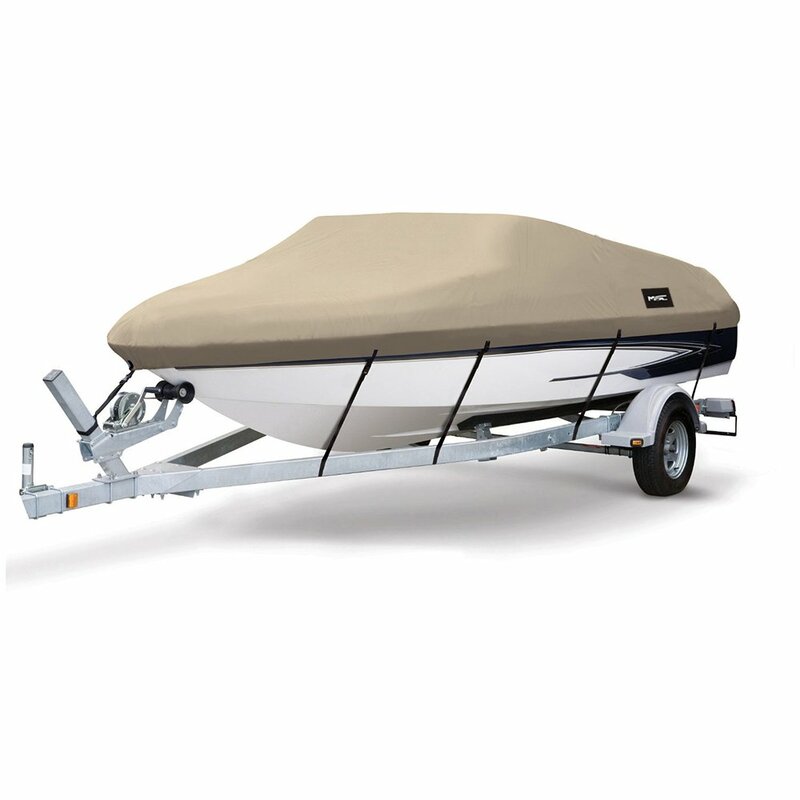 Last on our boat cover reviews, we have the Tan/Beige Vortex Heavy Duty Boat Cover. If you want your boat interiors to remain dry as a bone without paying a premium for the cover, this is the model to think about. The cover is made for rounabouts and fishing ski with a length of between 19 and 22 feet and a beam width ranging 60 to 106 inches. Made of 600D nylon, the material is thick enough to keep your vessel from harmful elements. The cover’s construction is such that no water is allowed into the boat. UV rays and dust are also effectively kept out. Once you remove it from the box, you it’s contained in a nice bag. This bag will come in handy for storing the cover when you’re not using it. Although the cover looks heavy, it’s actually easy to lift and put on your vessel. The installation takes not more than five minutes, thanks to the good design and the elastic hem, which creates a nice and firm fit quickly. The fit is so good; it even covers the bow rails on the front most of the time. 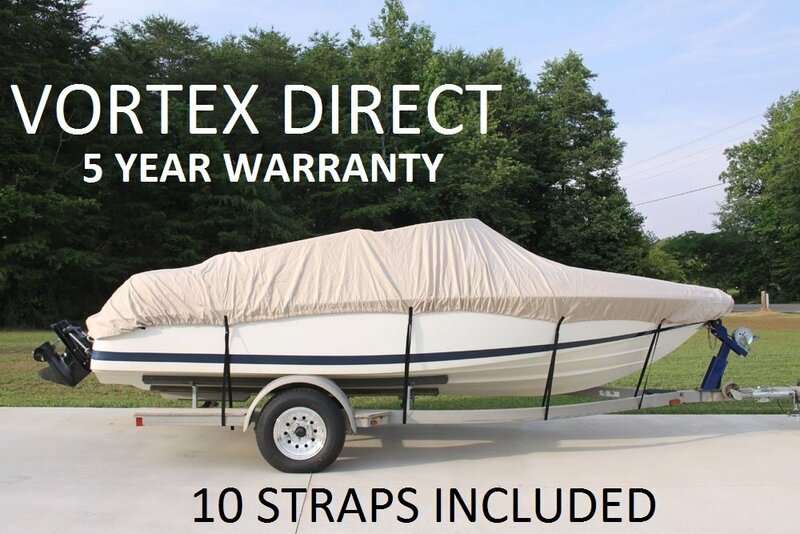 This premium cover comes with 10 straps to help you secure it to your boat. These are to be tied along the sides of the trailer, and the cool thing is that they’re super easy to install. Any downsides? Yes. The manufacturer, for some reason, thought it good to include just 2 colors – tan and beige. This is not a big deal, and surely, it’s not a deal breaker, but they might want to give us more color options. All things considered, the cover is awesome. Finding such quality for the same price is not easy. And that 5 years warranty makes it even better! How to Choose the Best Boat Cover? When looking for a good cover for your boat, there are a couple of factors you need to think about. For instance, the size. A certain model might be great when it comes to protecting a vessel, but what if it’s too big or too small? It won’t help, right? Below is a summary of the things to consider when looking for the right boat cover. The material will determine not just how long the cover lasts but also how well it protects your boat. There are two main materials used in the manufacture of boat covers – nylon and polyester. Both materials are durable and tough. But generally, polyester is better because it holds color more effectively, so it’s not going to fade as much or as fast as nylon. Furthermore, it’s more water resistance. A large number of manufacturers use the denier rating to declare the thickness of the material. The most common ratings are 300 denier and 600 denier. The higher the rating, the thicker and heavier the material, and thus the more effective it is. People looking the boat covers for winter buy 600 denier marine grade polyester that is urethane coated as it seems to work great. The marine-grade part is an indication that the material is specifically structured to deal with harsh conditions. Water is one of the elements that are most damaging to boat interiors. It encourages the growth of mold and mildew, especially where there’s minimal ventilation. The results? Bad smells, deterioration of the interiors, and formation of a bacteria nursery. As such, you need a cover that doesn’t allow the water in. Covers come in a broad variety of sizes to suit the wide array of boat sizes available. There are two size dimensions to think about when looking for an appropriate size – the centerline length of the boat and the beam width. Fortunately, most manufacturers declare the size of their covers. On amazon, you should see a part that allows you to choose the right size for your boat. At least the models we have in our reviews have this function. In fabrics, seams are normally the weakest part. They’re vulnerable to tearing and fraying, and they’re an entry point for the water. Some manufacturers get around this issue of tearing and fraying by double stitching the seams. Sealing them with a waterproof material helps prevent water from seeping in. If you want a cover that’s a good fit, then you got to get one with an elastic hem. Such a cover holds on tightly to your ride, cutting off the entry points for the moisture. The elastic hem also makes the cover look good as there’s no sagging. When there are strong winds, your cover will undoubtedly be blown away unless it is tied securely to your boat. That’s why the tying straps are important. Straps also come in handy during transportation. They keep both your cover and boat securely held to the trailer. The buckles and the adjustable features are for making the straps easy to tie and untie. If you look carefully at the covers in your reviews above, you’’ll see that almost all of them have these features. Now, let’s look at the types of covers available. Boat covers come in all shapes and sizes, and especially if you’re a beginner, you might not be able to tell which cover works for you. To familiarize yourself with the world of boat tops, check out the following popular options. This is the type we’ve dwelt on in this article. It’s a kind of top that is very similar to the one used on cars. You attach it to the bow and unroll it all the way to the rear part or stern of the boat. Convertible tops are used to cover water vessels during storage outside the water. The idea is to protect the vessel from damaging elements such as dust, snow, rainwater, UV rays, and leaves. Some of them are also designed to withstand the pressures of wind during towing. These are very similar to convertible covers. The only exception is that they’re used for boat storage in the water rather than outside the water. Like the convertible tops, mooring tops are stretched around the top and the sides of the craft. The objective is to protect the interiors from the splashing water. Mooring covers are generally not meant for towing. That said, a few models come with straps to secure them tightly during boat transportation. Metal poles are attached to the frame of the boat, and a canvas material is attached at the top, to offer a shade-like effect. Some models come with sidings alongside the top canvas to offer full protection. Normally, the purpose of bimini tops is not protection of the boat during storage. It is rather a protection of the passengers from rain and UV rays during a trip. Looking for a high-quality top to keep your boat well protected during storage or transportation? Then don’t buy just any brand you find. Buy from a trusted brand to boost your chances of getting a high-grade cover. Here are some of the most trusted boat cover brands. The humble beginnings of Classic Accessories date back to 1983, when Jacob, the founder, recognized a need for comfort accessories for vehicles. He thus started a company in Seattle, US. At the time, the company only manufactured steering wheel covers, seat belt pads, and other small accessories meant to make using automotives more comfortable. As time went by, the company expanded its operations and introduced more items into its product line. Among these items were an assortment of high-quality boat covers. Leader Accessories is a brand based in Beloit, Wisconsin, US. For more than 30 years now, this brand has brought into the market products that have made better the life of outdoor leisure enthusiasts. With their superior manufacturing tech, they make some of the finest boat covers. And that’s not all. They also make and sell boat seats, powersports bags, and a whole range of other items for RVs and water crafts. Amazon’s in-house brand for fast-moving consumers goods, AmazonBasics, offers you some of the finest products. The brand stocks a wide selection of products ranging from kitchenware to electronics and more. When it comes to boat tops, AmazonBasics isn’t left behind; it offers some of the highest-quality ones at great prices. The coolest part? Free delivery and a good warranty from Amazon. PrimeShield is a Chinese brand that deals in covers. Its covers are used on motorcycles, boats, cars, and more. The cool part is that PrimeShield uses good materials to produce their covers, to ensure the quality is flawless. Thus, their covers perform well and last long. They also come with a good warranty from the brand for the buyer’s peace of mind. iCover is an online seller that specializes in covers for grills and boats alongside a few other products. The good thing about this brand is that it manufactures its own products, and thus it’s in a position to offer you its amazing products at low prices. By taking its products through a stringent quality assurance process, the brand ships high-quality products to keep the customers happy and satisfied. Your cover might be 600D marine-grade polyester fabric, but if you don’t take care of it, then the material won’t matter. It will deteriorate just like a cheap quality cover. Don’t allow water to pool at the top – support poles will help you do that. Don’t let the snow, dust, leaves, and other debris sit on your cover. Use a rag and some lukewarm soapy water to wipe it down from time to time depending on how much matter has settled on it. Tie the cover down securely – the wind causes an untied cover to waggle, causing it to tear or fray. If the wind is strong enough, it might even blow away the cover. To prevent that, use strong straps to tie the cover down to the boat. During installation, remove any parts of the boat that might pierce the cover or apply a pad on them. Restore that water repellency – truth is, with time, the water repellent finish diminishes. When you notice your cover is no longer holding off the water effectively, use a high-quality fabric guard to restore the water resistance. 303 Fabric Guard should do it. Don’t use detergent to clean the cover – some covers’ water repellent finish might get diminished by some detergents. Be sure to check the instructions on cleaning and take note of the allowed and the forbidden cleaning products. Before storage, make sure you wash the cover and dry it thoroughly. Store it in a nice bag and ensure it’s protected from heat and moisture during storage. Below, you might find answers to some of your most burning questions. Q1. Will a boat cover keep the water out? One of the advantages of having a boat cover is that it keeps the water from getting into your boat’s interiors. A waterproof boat cover prevents the formation of mold and mildew in your boat. And of course, it helps prevent corrosion because moisture is one of the elements necessary for corrosion to occur. Q2. How do I put the cover on my boat? It’s possible to do it alone, but a boat cover is better installed by two people to make it easier and faster. Put the bow end on the bow and unroll the rest of the cover toward the back/stern. The bow end might have a sewn tag saying “front”. When unrolling, ensure the coat covers the sides evenly and make sure it is well centered. Locate the straps and use them to secure the cover to the boat. Tie them appropriately to the sides of the trailer. This is a shortened version of the process, so be sure to check the step-by-step guide in your cover’s user manual. Q3. Should I clean my boat cover? Yes, of course. The dust, ice, snow, leaves and other items that fall on there will, without a doubt, cause the cover to deteriorate if left to accumulate. Cleaning the cover regularly helps it last longer. Q4. How do you clean a boat cover? Use lukewarm soapy water and a soft rag. Once you’re done, use clean water to rinse the cover and allow it to dry. Avoid using detergents or any abrasive cleaners as you might ruin the waterproof coating on the cover. Your manual should contain more information on cleaning; be sure to have a look. Q5. What is the best material for a boat cover? Boat covers are generally made of either nylon or polyester. Polyester is better as it’s more resistant to water and more capable of retaining color. A boat cover made of 600D 100% polyester that is marine grade and PU coated will serve you well for many years. Q6. What makes a boat cover trailerable? Being trailerable means the cover can be safely used when towing the boat without tearing or fraying from the wind. As long as the material is high-quality and tough, and the cover fits properly over the boat, then it’s trailerable. Q7. What is a breathable boat cover? It is one with air pores or air vents to let in some air and allow any moisture on the inside to escape. A breathable cover helps prevent the development of mold and mildew in the boat. Q8. Do I need tying ropes? Yes, tying straps are extremely important. They will help secure the cover to the boat, so it doesn’t sag or get blown away by the wind. Support straps help prevent waggling, a phenomenon that causes deterioration through fraying and tearing. We hope that we’ve been helpful to you. With the right top, you will be able to keep your boat safe from dust, moisture, wind, leaves, snow, and other elements that might damage it. Go ahead and select a suitable model from our top recommendations of the best boat covers. But before clicking buy, make sure it’s the right fit for your craft.